Beyond the mega-events listed above, we also have the first appearance of Spider-Man's symbiote costume, She-Hulk joining the Fantastic Four while the Thing adventures on the Secret Wars Battleplanet, the marriage of Black Bolt and Medusa, Storm losing her powers, and the beginning of a big Wraith War storyline in ROM. There's an abundence of mini-series, oddly not always by top creators, like Bill Mantlo's Jack of Hearts. But in the Kitty Pryde and Wolverine mini by Claremont, Kitty Pryde becomes Shadowcat. And Roger Stern introduces the West Coast Avengers. 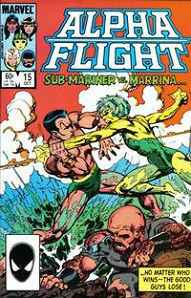 And in a poorly written Prince Namor mini, the Sub-Mariner is removed from the throne of Atlantis. Marvel releases the Official Marvel Try-Out Book this year. 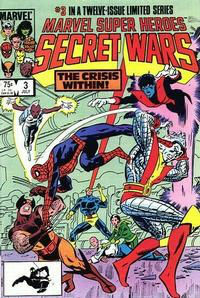 It was sold as a way to "simulate a real working situation" in the comic business, and it was also accompanied with a contest in which the winner would get to work for Marvel. The winner of the penciling portion of the contest was Mark Bagley, who was subsequently given a number of low profile, non-continuity projects but eventually went on to prominence on the New Warriors and Spider-Man. Three Direct Market only books (Ka-Zar, Micronauts, and Moon Knight) are canceled. Two of the books are replaced with new series that are available on newsstands. Micronauts: The New Voyages will have a decent run of 20 issues. The new Moon Knight book, Fist of Khonshu, will only last six issues. Ka-zar, we are told (August Bullpen), will come later (but 'later' in this case means 1997). For a while during the 1950's, and again from the early 1960's through the early 1970's, [Stan Lee's] "right hand man" was Sol Brodsky, Production Manager. Besides overseeing the mechanics of getting the books created and printed, Sol handled anything legal, financial, technical or complicated, that is, anything Stan didn't want to be bothered with. Later, Brodsky became V.P. of Operations, and he was still integral to a lot of the behind-the-scenes nuts and bolts of getting the comics out the door. 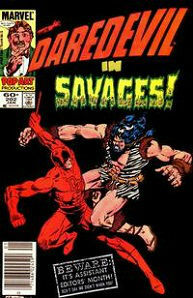 He was also one of the original Bullpenners who was there pretty much from the beginning of the Marvel age. Cover price is 60 cents this year, with prestige books being 65 or 70 cents and double-sized books $1. New characters: Leech, Cypher, the Hellions (Thunderbird, Empath, Tarot, Roulette, Catseye, Jetstream), The Beyonder, Titania, Volcana, Spider-Woman (Julia Carpenter), the techno-organic Warlock and his father the Magus, Forge, Omega Flight (Box, Wild Child, Diamond Lil, Flashback), Terminus, Black Fox, Gee, Lightspeed, Massmaster, Energizer, Lila Cheny, Puma, Ogun, Madison Jeffries. New Mutants #18-20 1st Warlock & Magus. Rachel Summers arrives. Alpha Flight #11-12 1st Omega Flight (Box, Wild Child, Diamond Lil, Flashback). Death of Guardian. Uncanny X-Men #185 Storm loses her powers. Amazing Spider-Man #256-258 1st Puma. Spidey's costume revealed as a symbiote. Kitty Pryde and Wolverine #1-6 1st Ogun. Kitty Pryde becomes Shadowcat.